Experience the most exciting safaris on the African continent. Visit Tanzania's national parks with their rich eco-systems of lush flora and fauna. Admire the vibrant flamingos and mighty hippos of Lake Manyara, the herds of zebras and wildebeest of the Serengeti and the beautiful natural sanctuary of Ngorongoro. Finally, enjoy an All-Inclusive stay on the paradise beaches of Zanzibar. International flights: UK - Kilimanjaro, Zanzibar - UK. 5 Breakfasts, 4 Lunches, 4 Dinners & All-Inclusive in Zanzibar. Safari in the Ngorongoro Conservation Area and game drive in the Serengeti National Park. ** Possibility of booking an upgrade to Acacia Farm Lodge 5* in Karatu in the next step of the booking. IMPORTANT: We strongly recommend you consult your doctor regarding the vaccines needed. Arrive at your UK departure airport, ready for a flight to Arusha. Night on board. Arrive at Kilimanjaro airport and transfer to the hotel in Arusha. Arusha is the most important city in the north of the country and the "capital of safari", as it's the main gateway and starting point for different wildlife expeditions. Overnight stay in Arusha. Breakfast at the hotel. Set off for Lake Manyara in the East African Rift. 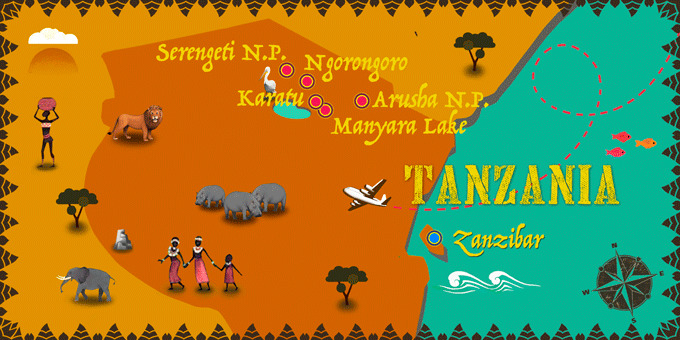 A vast lake, home to a rich diversity of wildlife and the perfect place to begin your safari. Expect to see amazing birdlife such as flamingos and mighty hippos cooling themselves in the refreshing waters of the lake. Enjoy a picnic lunch and transfer to Karatu and check-in to the lodge. Dinner and overnight stay in Karatu. After an early breakfast at the lodge, leave for the Serengeti National Park and enjoy an exciting photographic safari in the Ndutu area, in the iconic Ngorongoro Conservation Area, known for its abundant wildlife and vast landscapes. Continue into the Serengeti National Park, stopping for a picnic lunch before continuing through the savannah to your camp. Arrive at the camp, dinner and overnight stay in the Serengeti. Breakfast at the camp. Today enjoy a full day game drive in the Serengeti National Park with picnic lunch. The Serengeti National Park has the largest concentration of plain animals with plentiful mammal and bird species. Enjoy this opportunity to spot the abundant wildlife. The Serengeti is famous for its annual migration of over 1.5 million wildebeest and 250,000 zebra. Return to the camp. Dinner and overnight stay in the Serengeti. Breakfast at the camp. In the morning, set off for the Ngorongoro crater, descending to the bottom of the crater for a unique and unparalleled safari experience. Enjoy a picnic lunch in the amazing surroundings before returning to the top and to the camp, located at the edge of the crater. Dinner and overnight stay in Ngorongoro. Breakfast at the camp. Today, return to Arusha airport ready to check-in for a flight to Zanzibar. Arrive on the idyllic island of Zanzibar, famed for its paradise beaches and the beautiful old town of Zanzibar City. Transfer to the hotel to begin your All-Inclusive stay. Overnight stay in Zanzibar. All-Inclusive. Make the most of a free day to enjoy the paradise beaches of Zanzibar, one of the islands located off the coast of Tanzania. You can take the day to relax on the beach or make the most of your hotel facilities. Overnight stay in Zanzibar. All-Inclusive. Spend a day at your leisure, soaking up the sun and relaxing on the white sands. If you are looking for a little more culture we would recommend a visit to the Beit el-Ajaib (House of Wonders) in Stone Town, which is said to be the grandest building in Zanzibar. Here you can marvel at the gigantic carved doors and find out more about Swahili culture and life on the Indian Ocean at the Museum of National History and Culture, which is housed inside. Overnight stay in Zanzibar. All-Inclusive. Spend the day at your leisure. To see more of the town try visiting the Darajani Market in the Stone Town. The market mostly sells food and local produce. Taste some of the local delicacies or buy some spices to take home with you. Overnight stay in Zanzibar. All-Inclusive. At the indicated time, transfer to the airport for a flight back to the UK. Night on board.